A dozen Gentle Breeze Honey were at a site in the summer. Woller contracts with farmers and CSA organizations to place the hives on fields across southern Wisconsin. Brenda Falk shared her firsthand experience with low-cost home building during the Traditional and Green Skills Event at Prairie Farm High School. Other sessions throughout the day covered topics ranging from farm accounting and Amish living to growing elderberries and raising alpacas. Karen Schnell of Clayton, right, chatted with a vendor in the locally made products bazaar at the Traditional and Green Skills Event held in Prairie Farm. PRAIRIE FARM — Eager to know more about elderberries? Flirting with the idea of grass farming? Curious about kombucha? Look no further than the Traditional and Green Skills Event hosted annually by the Hay River Transition Initiative, which formed in 2005. This year's event, which featured a full day of classes and a bazaar highlighting locally crafted items, was held March 9 at Prairie Farm High School. About 100 attendees learned from local instructors about everything from alpacas and Amish living to timber framing and trees. In its ninth year, the event was launched by a group of people interested in following the Transition Town model, according to organizer Sue Gerlach. Gerlach said the initiative's goal is to bring people together to plan for changes in the future, rather than "waiting for a crisis." Challenges such as climate change and economic instability can be better met by cultivating a positive local response. The 2018 Traditional and Green Skills Event drew more than 240 people who attended 26 classes and browsed a vendor area coordinated by more than 60 volunteers. "Attendance was quite a bit lower this year, likely due to the over-the-top report of an impending storm — very impactful to a location as remote as ours," Gerlach said. "We do want to grow the event's attendance, and next year is the 10th anniversary, so we'll be making some special arrangements to highlight this." Other things the Initiative has organized through the year include stone soups, a community garden, seed and plant swaps, garden and farm tours, canning and seed libraries, energy interest groups and a spring roto-tilling project. Gerlach said some future projects may include a tool library and a group solar buy. "Some years, the Hay River Transition Initiative is more active than others, and the group changes as people and interests shift," she said. LouAnn Binsfield was one of three speakers on low-cost, do-it-yourself home building. "My build is in progress," said Binsfield, who with her husband bought a teardown house in Chetek for supplies and hauled them to their property. For only about $3,000, they got the trusses, plywood, floor joists and more. Other materials came from their own land, ReStore, along the roadside, garage sales and Facebook Marketplace. They got used kitchen cabinets from family and borrowed many of the tools they needed. Binsfield, 61, said they have owned their farm for about 40 years, and it was her husband's dream to build there someday. Since bringing in materials from the teardown home a few years ago, they have done their own excavating and most of the construction, electrical wiring and plumbing. They hired the cement work done. Binsfield said she has done the wiring herself, with a local electrician checking her work periodically. Friends and family have helped with the project, and the Binsfields hired several Amish men to do some of the work as a fundraiser for their school. Binsfield recommends asking a lot of questions, checking local building codes, using the Internet and YouTube videos, saving any receipts to return unused materials and taking advantage of Menards 11 percent off mail-in rebates whenever possible. "Spend money on what you really want, and use local help," she said. "No question is a bad question unless you don't ask it." Brenda Falk discussed going off the grid and using solar panels. "If you're considering going off-grid for your build, be sure to research and talk to those who live off-grid," she said. "Don't be in a rush with building; we really wanted to get the heck out of our camper. We maybe went too quick because we didn't want to spend another winter there. Get what you want so you don't have to redo anything later." Falk said the types of appliances in the home and routine energy usage play a big role in determining the size and scope of a solar project. In her build, she sought advice from a lot of people in the community and borrowed tools from friends. She's still working on the home's siding and rock in the basement. "It's not worth you buying (a tool) to use it one time," she said. Curt McNamara, who purchased a farm with an off-grid house run on solar between Downing and Knapp, said systems vary widely and depend on household activities. He said his more than 30-year-old home doesn't "run like a normal house." "You just kind of learn how and when you can do things," he said. "I've switched from listening to music at night to during the day. If we get a washing machine, we will run it only on sunny days. It's a very different way to structure your life." McNamara said some of his panels are a couple of decades old and still work just fine. When buying new ones, he recommends avoiding shipping expense, which can be quite costly. While it may take a little longer to get them in, "see if you can piggyback on a larger order," he said. Willis Mast offered insight into the Amish way of life and traditions. Mast and his wife, along with their six sons and three daughters between the ages of 1 and 19, have a 20-acre farm near Prairie Farm. In addition to rotationally grazing sheep and raising one cow, horses and chickens, he does carpentry work with a local contractor and, by this summer, hopes to open his own woodworking shop specializing in hardwood interior doors and cabinets. Within the next couple of years, he would like to direct market some of his lambs to Hmong customers in the Twin Cities. The average Amish farm is 50 to 60 acres and might include about a dozen dairy cows, horses, chickens and other livestock, along with a large garden (maybe an acre or two). Many Amish men do woodworking or have sawmills. Some families have gotten out of milking cows in recent years, he said, adding, "It just doesn't pencil out to make money." However, some area Amish dairy farmers are forming small cooperatives to start making their own cheeses. "Quite a few still milk by hand, and there is demand for cheese made from milk not from milkers," he said. "That has been working out fairly well and bringing back the dairy farms for the young generation." In his talk, Mast discussed everything from Amish schools, which children attend from grades 1-8 before learning a trade or helping out at home, to funerals, which might draw as many as 1,000 mourners. Dating, health care, childbirth, crime, finances and taxes were other topics. Amish church services typically are held every two weeks and rotate among homes, Mast said. Services normally are three hours long and include a couple of sermons. Lunch is served, then everyone goes home to do chores before returning that evening to the hosting home for supper and hymns. Mast, who said he has siblings in Michigan, Kentucky and Ohio, said many Amish people travel, when necessary, by bus or Amtrak. Flying is frowned upon and done only in emergency situations. Many have access to a local driver with a passenger van. The going rate is 50 cents to $1 per mile. "Most Amish have something like that," he said. "It's nice; that's the old neighborhood." Mast said there are about 26 different groups of Amish, which vary slightly in how conservative or progressive they are. Some Amish farm with tractors, while others don't at all or use steel wheels instead of rubber. "People often get the groups confused," he said. "As a rule, we all still do our stuff the same way. Some communities just use more modern conveniences and technology." Sixteen Harvestore silos lined two barns on a farm in the rural Brown County town of Glenmore. The Wisconsin Department of Agriculture, Trade and Consumer Protection announced that, as of March 1, nearly 2,100 individuals and businesses applied to grow or process hemp in the second year of Wisconsin’s industrial hemp program. 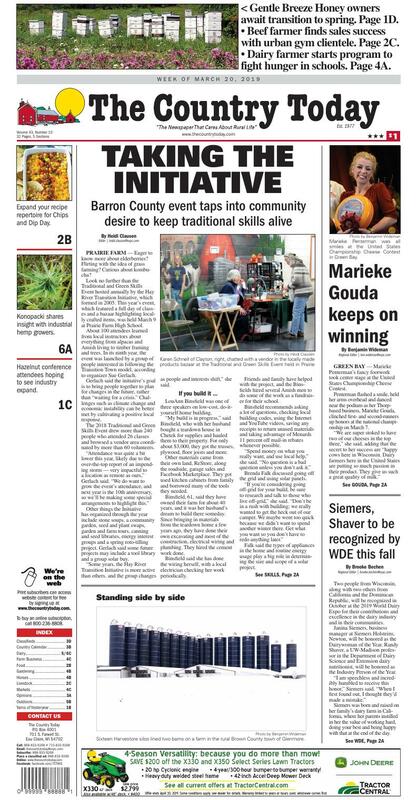 Marieke Penterman of Marieke Gouda in Thorp had cheese entries take first- and second-runner up honors at the United States Championship Cheese Contest in Green Bay. Marieke Penterman was all smiles at the United States Championship Cheese Contest in Green Bay. Penterman flashed a smile, held her arms overhead and danced near the podium as her Thorp-based business, Marieke Gouda, clinched first- and second-runners up honors at the national championship on March 7. The Marieke Gouda Premium entry placed second overall at the 20th biennial event with a score of 98.419 out of 100, while the Marieke Gouda Overjarige entry took third with a score of 98.39. Guggisberg Cheese of Ohio was crowned grand champion with a baby Swiss entry that scored 98.54. Guggisberg Cheese also produced the top cheese in 2015, while Marieke Gouda staked its claim as best cheese in the land in 2013. This year’s event featured a record-setting 2,555 entries from 35 states. The competition ranks as the largest technical cheese, butter, yogurt and dry dairy products contest in the country. A team of 60 nationally renowned judges from 20 states analyzed each entry’s flavor, texture, salt, color, finish and appearance. Overall, Wisconsin cheesemakers dominated this year’s event, earning Best of Class awards in 57 of the 115 classes and placing 10 entries among the top 20 finalists nationwide. Leading the way was Marieke Gouda, with nine entries placing in the top three of their respective classes. After taking celebrating dance steps on stage at the awards presentation, Penterman shifted the spotlight to her fellow cheesemakers and colleagues at Marieke Gouda. Penterman highlighted her team among those people doing a great job. Penterman was born and raised in the Netherlands, where she grew up on her parents’ 60-cow dairy farm. She met her future husband, Rolf Penterman, in Canada while serving a dairy farm internship. Rolf ended up moving to Thorp and starting a dairy farm. The couple eventually reconnected, got married and are raising their children in Clark County. Marieke Penterman wanted to start her own business before she turned 30, originally setting her sights on custom decorating children’s furniture. Then one night she had a revelation. With a few thousand dollars, including a loan from her parents, Penterman got the operation up and running using milk from their Holstein and Brown Swiss cows at Penterman Farms. Four months later, the Pentermans entered their first U.S. Championship Cheese Contest and emerged with a medal, the first of more than 150 national and international accolades over the years. Marieke Gouda is among a handful of Wisconsin farmstead cheese operations, meaning the cheese it produces is made from milk collected solely on that same farm. Penterman developed a deep appreciation for cheesemaking over the years. And so is staying true to their roots. Penterman said they haven’t explored producing any cheeses other than Gouda. “I remember we had a consultant come in and he said to me, ‘Marieke, if you’re not going to make Cheddar and Colby and all the other things that people are used to here, then you’re not going to make it,’” she said. Penterman said the sky’s the limit regarding opportunities for selling Gouda. Marieke Gouda is at 200 W. Liberty Drive, Thorp. For more information about the business, call 715-669-5230 or visit www.mariekegouda.com. Janina Siemers, business manager at Siemers Holsteins, Newton, will be honored as the Dairywoman of the Year. Randy Shaver, a UW-Madison professor in the Department of Dairy Science and Extension dairy nutritionist, will be honored as the Industry Person of the Year. Siemers was born and raised on her family’s dairy farm in California, where her parents instilled in her the value of working hard, doing your best and being happy with that at the end of the day. She didn’t expect to find herself working in the dairy industry, but fate had other ideas when she met her future husband, Dan, while he was completing an internship in California during his studies at UW-Madison. He won the heart of the farmer’s daughter, Siemers said, and the two of them returned to Wisconsin to join his family’s dairy operation, now in its fifth and sixth generations. When she joined the operation in 1995, Siemers was young and ambitious, and with a degree in business, she began taking care of “everything to do with paper” on the farm, including organizing employees, insurance and data entry as none of the documents had been computerized yet. “The family entrusted me and I’m grateful for their trust with such big responsibilities,” she said. Siemers now keeps track of 50 full-time employees, along with wearing many other hats at Siemers Holsteins, located on Lake Michigan between Milwaukee and Green Bay. Her husband and his brothers own the farm together, milking 2,500 cows and cropping 5,500 acres. She has been a 4-H Dairy Quiz Bowl coach in her county for more than 10 years and is a school board member for the Howards Grove School District. The family also hosted Wisconsin Farm Progress Days in 1997. While Siemers usually stays behind at the farm during World Dairy Expo each year, and has been happy to keep things going while others are away, she acknowledges this year will be different. “It’s just an incredible honor,” she said. “And there’s no possible way this could have happened without the family and the trust they have for the next generation. “This is where my passion always lied and this is what I love to do,” she added. Randy Shaver was born and raised in western Pennsylvania on a dairy farm. He completed his bachelor’s degree in dairy science at Pennsylvania State University, his master’s degree in dairy science from the University of Maryland and his doctorate in dairy science from UW-Madison. While pursuing his Ph.D., Shaver conducted research for UW-Madison and the U.S. Dairy Forage Research Center, which prepared him for an eventual career in dairy research. From 1986 to 1988, Shaver worked in industry, then joined the faculty in the Department of Dairy Science at UW-Madison with a 75 percent Extension and 25 percent research appointment. He has educated industry consultants, feed professionals, veterinarians and dairy producers throughout the U.S., connecting academia to the dairy industry by carrying research out of the labs and into fields, farms and Extension offices. During his time at UW-Madison, he has advised or co-advised 30 master’s and doctoral students and has authored or co-authored 104 peer-review journal publications, 182 scientific abstracts, 108 popular-press articles in industry trade magazines and 260 newsletter articles, Extension handouts and Internet publications. Shaver is a popular speaker at dairy industry conferences and workshops, presenting in 46 U.S. states and in more than a dozen countries, including Chile, China, Germany and Mexico. Along with receiving the 2019 World Dairy Expo Industry Person of the Year award, Shaver has also been honored with the American Dairy Science Association’s American Feed Industry Association Award for Dairy Nutrition, as well as the association’s Pioneer Hi-Bred Forage Award, DeLaval Dairy Extension Award and Nutrition Professionals Applied Dairy Nutrition Award. He was also recognized with the UW-Madison College of Agricultural and Life Sciences Pound Extension Excellence Award. Receiving the honor of World Dairy Expo’s 2019 Dairyman of the Year is Steve Maddox of Maddox Family Dairy, Burrel, Calif. Dr. Julio A. Brache Arzeno of Rica Group, located in Santo Domingo, Dominican Republic, will be honored as the Expo’s 2019 International Person of the Year. These four outstanding dairy professionals will be recognized during the World Dairy Expo Dinner on Oct. 2 in the Exhibition Hall at the Alliant Energy Center. Banquet tickets will be available online at worlddairyexpo.com beginning July 1. This year’s World Dairy Expo, scheduled for Oct. 1-5 in Madison, marks the 53rd year of the event that draws more than 65,000 people from all across the globe. It is the world’s largest dairy-focused trade show featuring dairy and forage seminars, world-class dairy cattle shows and more.